This photo was taken on June 7, 1994, from the Staten Island Ferry. Because it was night I used a long exposure time and the thrum of the Ferry’s engines cause the lights of the skyline to appear as crescent moons. when I first saw the developed image, I thought it a failure and almost threw it out. Instead I tossed it in a box with some other sub-par photographs. In early 2002 I found it again. 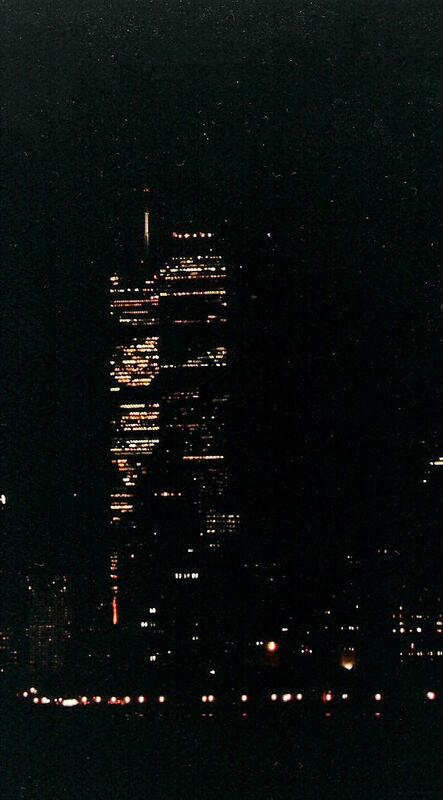 Of course it had a totally different effect–a suggestion of the World Trade Center, towers invisible, only the blurred outline of the lights against the night skyline. By the time I rediscovered the photo, I was working for the American Red Cross. My journey there (too long to go into here) was very much like that photo. I don’t mean to negate the tragedy of that morning–it was awful in many ways and some of the harm can never be undone. But when people united to take action there were also many good things that happened, stories of courage, hard work, and sometimes just a dogged determination not to give up. People reached out to help one another, and made enormous donations of money, time and blood (which turned out to be unnecessary, but was generous nonetheless). There was an awareness of how vulnerable our nation’s large urban centers are, which led to efforts (still not complete, but at least begun) to prepare for disasters. And personally, I got to know an excellent group of people while working for the Red Cross.